In years past, art has been a subject that hasn’t gotten much attention in our homeschool. We’d do an occasional project here or there, but that was the extent of our artistic endeavors. Our lack of artistic interaction is not because I do not value art. It’s just a subject we hit after we finish up the major subjects and if we have time. This school year I have turned over a new leaf. I’m making time for art by using a great DVD based art curriculum (Home Art Studio) and doing more detailed art studies. 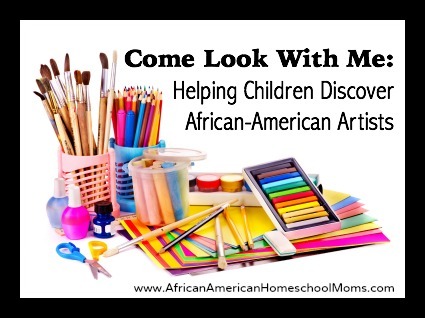 However, one of my more specific goals is to introduce my girls to several African-American artists, so I’ve decided to incorporate an African-American artist’s study several times throughout our school year. If you’d like to do such a study, but are not sure where to start, I’ve got a fantastic recommendation for you! Come Look With Me: Discovering African American Art for Children by James Haywood Rolling Jr. is a fabulous resource featuring twelve different African-American artists (Palmer Hayden, Clementine Hunter, Henry Ossawa Tanner, Charles Alston, Aaron Douglas, Sarah Albritton, William H. Johnson, Hughie Lee-Smith, Elizabeth Catlett, Jacob Lawrence, Ellis Wilson, and Romare Bearden). Each chapter discusses a different artist and includes a print of one of the artist’s most famous works, three to six questions to get children to talk and think about the artwork, and a short artist’s biography. Though the book can be used alone, it can also be used as a springboard to help children create great works of art and serve as a source of field trips find the artists’ works in museums. Now that I’m inspired, I’m ready to begin our art excursion and I hope you’ll join me. Throughout the year, I’ll be back to introduce the artist were learning more about in our study. I know my girls are going to love what I have planned and I think your children will too. Gather your art supplies and check back regularly!